Humans Not Robots - support and resources for SEN / SpLD: We need to talk about Wade? We need to talk about Wade? This post is perhaps best started with two disclaimers. Firstly, I do not own a games console. Although I did enjoy the first two instalments of the Halo series, via a younger brother's Xbox, I took a decision some years ago that I had better ways to spend my time. This decision came after spending an entire Saturday glued to a screen 'masterminding' a failed Space Marine attack on the strategy game Dawn of War - which then abruptly failed! Secondly, I have not played Grand Theft Auto V. The concerns I raise about this particular game are based on YouTube clips and a recent conversation with a former colleague about his experiences of playing the game. I realise, that by making criticism of this game, I risk falling into the age-old trap of condemning something not fully known and understood. As such, I will keep my comments on this particular issue brief and restrained! The child development and education writer, Sue Palmer, has written prolifically on the issue of technology and the nurturing of young people. I tend to agree with Sue Palmer's argument that in recognising the benefits of playing computer games in developing problem-solving capacity ('S-type' skills), we also must recognise that too much time spent in isolation in front of a computer screen can hinder the fostering of interpersonal qualities ('E-type' skills). In the 'real world' of work-based teams, family, friendships and love, it is clear we need as much of the latter as we do of the former. The same goes for risk-taking, highlighted in the articles cited above and also touched upon by Sue Palmer in her book, 21st Century Boys. In conservations with many teenage boys I have listened as many enthusiastically proclaim a wish to join the armed forces. The appeal of becoming a soldier is natural for young people seeking adventure - a path I also seriously considered at a similar age - and offers much in terms of the transferable skills that can be gained, especially technical trades. However, when exploring this further with students over the past few years I have noted that the ambition frequently comes from playing games such as Call of Duty with their vision of the future centering solely on frontline Rambo-style action. It seems they have little realistic idea of the demands or risks. And so, now onto the most recent computer game craze, Grand Theft Auto V. Those following the @HumansNotRobots feed on Twitter will see I supported the voicing of concern over the 'mental patient' costumes over the past week or so. However, following a conversation with my former colleague about GTA V and the interplay between crime boss 'Trevor' and his sidekick 'Wade', a character portrayed as having cognitive difficulties, it struck me attention also needs drawing to this particular issue. 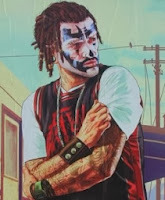 A quick search of 'GTA V Wade' on Twitter brought up lots of examples of young people casually mocking this character as a 'retard', 'mentally handicapped' and 'speaking funny like Flynn from Breaking Bad.' How much of this attitude feeds back into school communities should be a concern to teachers and parents. The counter view is that GTA V is clearly rated as adults-only and deeply satirical, as Tom Watson MP has argued - that we could compare it with critically-lauded films such as Reservoir Dogs and Fight Club or the more recent Breaking Bad TV series. However, as argued in an online letter from a computer games salesman - 'I Sold Too Many Copies of GTA V To Parents Who Didn't Give a Damn' - parents need to be a bit more clued-up of just what they are buying when their son or daughter asks them to pick up the latest computer game whilst doing the weekly shop. In terms of schools, it strikes me that staff - as my former colleague did - also need to take the time to find out more about the games which we dismiss as passing fads but in fact need addressing with students so that the divide between fantasy world and real world remains firm in their minds.